The most important aspect to consider when purchasing hockey equipment is that the equipment be properly fitted. Improperly fitted equipment may expose the player to injury. The best way to purchase hockey equipment is to actually try the equipment on. The following information and charts will provide general guidelines on sizing equipment. Generally, skates will fit 1 to 1 ½ sizes smaller than your shoe size. For women, this size is 2 to 2 ½ sizes smaller. CCM skates tend to be wider, and Bauer's tend to be narrow. If you have wide feet, you might find CCM's are much more comfortable, whereas if you have narrow feet, you might find them too loose. In the end however, a proper fit is determined by trying on a number of different types and sizes and feeling which ones are most comfortable. When trying the skate on, you should kick your heel into the very back of the boot, and your toes should only barely be able to feel the toe cap. If they curl, or are crushed in any way, the boot does not fit properly. As you lace up the boot, be sure to kick your heel back so that it stays firmly locked against the back of the boot. Laces should be snug, but not too tight. Common practice is to have looser lacing along the front of the footbed, tighter lacing along the part of your foot where the ankle meets the foot, and then slightly looser up near the top. When completely laced, eyelets should be 1.5 to 2" apart. If further apart, a wider boot would be better. And if the eyelets are closer, look for a narrower boot. When the skates are laced, get up and walk around. The heels should remain firmly against the back of the skate. If it slips or there is movement, then the skate is too large. Your foot should be comfortable in the footbed, and your toes should be able to lie flat in the boot. It is always a good idea to take the skates off completely and trying them on again before making any final decisions. Red areas or pressure points on your feet are signs of an improperly fitted skate. When fitting children, remember not to fit them too large, even though some room for growth should be given. It is wise to only have about a half an inch between the heel and the boot when their foot is pushed up as far as it can go into an unlaced boot. Also, remember to buy them as close to the season they need them for as possible, so that they give you more wear before you must buy another pair. 1) Bauer skates fit 1 to 1 ½ sizes smaller than your shoe size. (e.g. size 6 ½ shoe will require a 5 ½ Bauer skate. 2) Women's' skates are usually 2 sizes above men's' skates (e.g. a 5 ½ men's skate is equivalent to a 7 ½ women's skate which is equivalent to an 8 ½ women's shoe size). 3) Graf skates fit one size smaller than shoe size. 4) Easton skates fit 1 ½ sizes smaller than shoe size. 5) CCM skates fit 1 ½ to 2 sizes smaller than shoe size. 6) Mission and Nike Ibrite series skate fit same as shoe size. 7) Nike Quest series skates fit ½ size smaller than shoe size. 9) Above sizes apply only to hockey boot style skates, moulded boots with liner, or figure skates normally fit same as shoe size. 1) Measure across widest part of foot in inches. 2) Standard skate width is called a "D" width. 3) Most skate makers also have C, E, EE, and EEE widths - triple E being the widest. Note: Both right and left foot needs to be measured since it's common to have one foot larger than the other. Ensure that the cap of the shin pad is centered on the kneecap. The calf padding should wrap around the lower leg. Measure from the center of the kneecap to the top of the skate boot (or 1" above the inside ankle). Match the player's shin size to the inches of the shinguards. The elbow pad should not restrict movement of the elbow. With the elbow pads on, test the range of motion by bending the arm at the elbow, watching for restriction. Shoulder caps should fit right over the shoulder tips. The arm pads should extend to just above the elbow to ensure full protection. Pads should not be too restrictive and should allow for freedom of movement. For sizing, measure around the chest just below your armpits. L = 28" to 30"
XL = 42" to 44"
M = 24" to 28"
L = 38" to 42"
S = 22" to 24"
M = 34" to 38"
XS = 20" to 22"
S = 30" to 34"
Pants should cover from just above the knee, up to the kidneys and lower ribs. Pants should not be too tight or restrictive. The areas to consider when choosing a helmet are protection, comfort and fit. You should always look for equipment that feels comfortable. The helmet should be adjusted to fit snug to prevent any shifting and maximize protection. Make sure the chinstrap is adjusted so it gently makes contact under the chin when fastened. It is recommended that the player wears CSA and HECC certified helmets. All CSA and HECC certified helmets have a sticker indicating their certification. Open your helmet to it's largest setting and place it on the head so that the rim is one finger width above the eyebrow. Gradually begin to downsize the helmet until a comfortably snug fit is achieved. Hat size method - measure from the top of one ear to the other ear crossing over the top of your head. Circumference method - measure around the forehead. The facemask should fit snugly to the chin. If it is too long, it may come into contact with the nose and mouth during impact. When the player's mouth is closed, the chin should fit comfortably into the chin cup. Attach the face mask securely to the helmet according to instructions provided within the product packaging. Neck guards are designed to protect the throat area from lacerations and cuts - they are not designed to protect against spinal injuries. The neck guard should be snug, but not uncomfortably tight. It should completely cover the throat, and with the bib style, the upper chest area. Measure the player's neck and match this size to the adjacent sizing chart. Neck protector must have a BNQ certification label. To measure a stick stand without skates in your stocking feet - top of stick should touch the tip of your nose. When standing on skates, the top of the stick should come up to the bottom of your chin. Stick length and stick blade patterns comes down to personal preference, defensemen may want to use a longer stick to give them a longer reach for poking the puck away, and forwards may want to use a shorter stick to help them stickhandle better. Is fitted according to waist size, some jock straps incorporate the garter belt, and some are incorporated with loose shorts - style is a matter of personal preference. Holds up hockey socks and is fitted according to waist size. Holds up hockey pants and is fitted according to body height. Holds shin pads in place, straps come in junior or senior sizes. Tape is generally of a poly (plastic) material and can be either clear or coloured. Generally mandated by the team. Sizing should not be too small or constrictive. Measure distance from inside ankle to the centre of the knee, while leg is slightly bent. Measure distance from centre of knee up the thigh to desired height, usually 4" to 8". 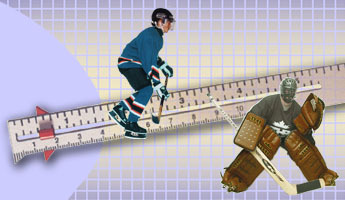 Add the 2 measurements to your goal skate size. Example: 16" + 6" + 10 (skate size) = 32". Generally your knee should fit slightly below the centre knee roll of the pad. Once the pads break in, your knee will be directly behind the centre knee roll. The top two straps on a goal pad should be worn loose.The first reason is most knee locks, knee cradles, and thigh guards, hold you in the pad and allow the pad to move properly with your leg. The second reason is your goal pant should break across the top of your knee cap, riding behind the top of the pad. This double coverage increases protection and allows for better mobility. Your arm/chest pads and catcher/blocker gloves should provide continuous protection for the length of your arm and hand. The cuff of your catcher/blocker gloves should extend one to two inches over the bottom of the arm protection on your arm/chest pads. To protect your fingertips, your fingers should not go all the way to the end of the gloves. Catcher and blocker gloves are sold in 'Regular' and 'Full Right' styles. 'Regular' is for right-handed players who use their left hand for the catcher glove and their right hand for the blocker and stick. 'Full Right' is for left-handed players who use their right hand for the catcher glove and their left hand for the blocker and stick. Goalie chest and arm pads protect your upper body and arms. For proper protection, your shoulders should fit comfortably into both shoulder cups and the pad should extend down to your waist. A variety of straps will allow you to adjust the fit for arms, chest and back. You should also make sure that the arms can be adjusted so that your elbows fit comfortably into the elbow cups. If the arms are too long, they will interfere with your catcher and blocker gloves. The arms should extend 1 ½ inches above your wrist bone. Your catcher and blocker gloves should extend up over the bottom of your arm pads. Arm & chest pads are sized based on the chest size and height of the goalie. Goal pants have additional padding in the inner thigh section. Boot is surrounded by hard plastic shell for added protection. The height of the boot in relation to the ice is lower, giving a lower centre of gravity and more stability. The blade is flatter (not rockered), leaving more blade in contact with the ice, which gives better balance. A goalie helmet has to fit snugly. This allows the shape and composition of the shell to equally distribute shot pressure. It is recommended that all goaltenders wear CSA and HECC certified masks. All CSA and HECC certified masks have a sticker indicating their certification. When fitting the goaltender mask, adjust the unit so that the upper perimeter of the frontal component is ¼ " above the eyebrow. For a proper fit, make sure all straps are fastened so that the chin cup fits snugly against the chin and the mask achieves a snug fit. A goalie neck protector gives more protection than a player throat protector. The protector usually has thicker padding and sometimes additional plastic inserted between padding. Neck protectors should also have a BNQ certification label. Sizing is according to neck circumference. Junior = 11" to 14"
Senior = 14" to 18"
Goal jocks are fitted according to wait size. They usually come in either junior or senior size. The jocks have more padding and cover a larger area than player jocks. 1. Youth goalies under 10-12 years should not have a curve. House Leagues should wait a couple more years before buying a curved stick. Learn to stop the puck before shooting it. 2. Junior goaltenders don't need a huge curve. The bigger the curve, the bigger the chance of missing a shot at the stick. Pokechecking is more difficult with a curved stick - the toe of the stick is off the ice when the blade is pushed forward. In the backhand position, the puck can easily slide under the curved area. Curved sticks often cannot be placed totally flat. The blade is usually rockered which will put the toe up when the heel is down and vice versa. Rebounds are also much harder to control off a curved surface as opposed to a straight one. In stance with skates on and the stick blade flat on the ice, the shaft should not be higher than the goalie's shoulder. Buy a stick that fits. Never cut a goalie stick. They are balanced and cutting the shaft eliminates that required balance. 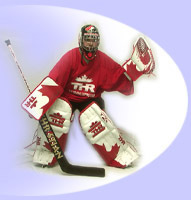 In stance with skates on and the stick blade flat on the ice, the blocker should be positioned between the waist and the bottom knee roll on the pad. If the blocker is too low, the goaltender will lean forward, be off balance and he will have difficulty with the top corner. If too high, the goaltender will have difficulty with low shots and stick maneuverability. In stance with skates on and the stick blade flat on the ice, the goaltender must be comfortable. Use the lie number on the shaft as a guide, but don't rely on each manufacturer's lie to be the same - they're not even close! (E.g. A Louisville l3 lie is 2 or 3 inches different from a Koho lie 13). Pro Pattern sticks often do not show a lie so be careful. The lie signifies the angle the blade is on. A 13 lie will position the blocker hand further away from the body and closer to the ice, thus creating a larger opening under the arm. Using a 15 lie will put the blocker hand closer to the body and further from the ice. Every goaltender will like a different lie and this may change during the season and throughout his/her career. It may be necessary to try several sticks before finding the correct one. Quite often incorrect glove positioning is mistaken for incorrect lie. Before rushing to get a new stick, make sure the hands are in the proper location.